Climbing is going sky high. Modern-day Sisyphuses gather every day in the AMO climbing gym. They climb their bodies up a wall. Having reached the top, they descend again. They know they can get cramps or uncontrollable trembling arms. Their bones can suffer. Their knees can get bruised and skinned. Yet they begin again, take another route, incessantly, without ever accomplishing any final goal. That’s why they’ve got a subscription. The last couple of years, climbing has risen and has become quite popular. 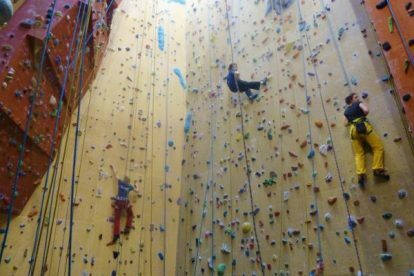 Indoor climbing spaces pop up and get filled with climbing-enthusiasts. I’m one of those climbing Sisyphuses as well (not a very good one, but that just means that I get to enjoy more of those sudden exciting Falls into Nothingness). AMO is my favorite climbing gym in Brussels. It’s one of the cheapest, has challenging tracks and there’s a very pleasant vibe. If you’re a climbing newbie and you don’t have any of the materials, you can use a belt and grigri for free! The only thing AMO does not rent out are climbing shoes, for the olfactory well-being of us all. But if you’re a beginner, a decent pair of regular shoes will do just fine. So, no excuses: even if you’re a tourist reading this, Brussels can be your first time climbing! Then you can see for yourself – when staring at the experienced climbers defying gravity in a most gracious manner – that climbing is quite a defying art.